India Gate, situated on the Raj Path in New Delhi, India. It is one of the most beautiful architectural spectacle in the heart of delhi built in the memory of martyrs who fought during world war. It is a tribute to 90,000 Indian soldiers of the British Indian Army who lost their lives in World War I and the Third Anglo-Afghan War. I got a chance to visit this place when I was in Delhi to meet my relatives. I planned with my cousin to visit this place. It was sunday and believe me this place was very crowded because people go there with their family and friends to spend their free time. Children were running around and playing in the open lawns surrounding the India Gate. At the time of sunset it looks beautiful. It also has a garden. Humayun Tomb is one of the most spectacular mughal buildings situated in New Delhi ,India. It was added to UNESCO world heritage site list in 1993 Built by Haji Begum the widow of Humayun. Its a magnificent tomb, situated in a very large complex where the great ruler Humayun is buried. 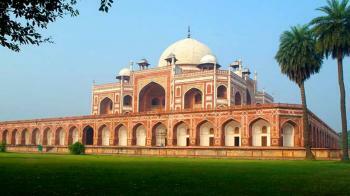 Humayun Tomb is the famous tourist place in delhi. If you are in Delhi, this is one of the must visit places. The complex of humayn tomb contains many small monument chief among them are black and yellow marble tomb of humayun wife and the tomb of humayun barber reffered as Nai ka Gumbad - The barber's tomb. 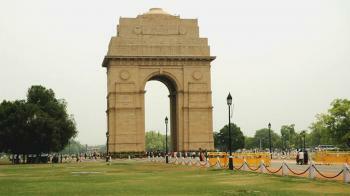 A must visit place in India, not very far from India Gate another major tourist attraction. Jama Masjid is the largest mosque in India. This great mosque is situated in Old Delhi with a courtyard capable of holding 25,000 devotees, which are more than any other mosque in India. It was begun in 1644 and ended up being the final architectural extravagance of Shah Jahan, the Mughal emperor who built the Taj Mahal and the Red Fort. 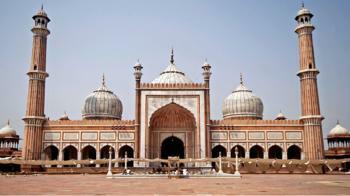 Initially Jama Masjid was known as the Masjid-i-Jahanuma, meaning World Reflecting Mosque in Persian. Constructed by 5000 workers over a period of six years this mosque is a major attraction in the city. The Jama Masjid can be seen from any region within 5 kilometer of its radius as it was located on a place which was on a higher ground in comparison to the other buildings of the area. Gurudwara Sis Shish Ganj Sahib is one of the oldest and historical Gurudwaras in Delhi. Located in Chandni Chowk in Old Delhi, the Sis Ganj Gurudwara was first established in the year 1783 to commemorate the persecution site of Guru Tegh Bahadur ji. Gurudwara Sis Ganj drives it name from "sis" meaning head which connote the fact about the demises of Shri Tegh Bahadur. Sis Ganj sahib is among famous Sikh Gurudwaras and it is equally revered by the Hindus. However I have seen almost all religions here in a single day, either they are Sikhs or Hindus, or any other community, loved the humbleness and calmness of the holy place. The Gurudwara Sis Ganj Sahib is visited by devotes on a regular basis and everyone is welcome here irrespective of their religion, caste or gender. 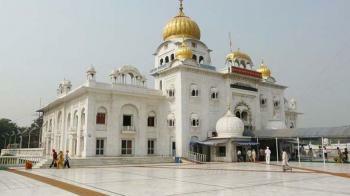 There are many other places to visit near Gurdwara Sheesh Ganj Sahib such as Gauri Shankar Temple, Red Fort etc. There is also big market nearby to do shopping. 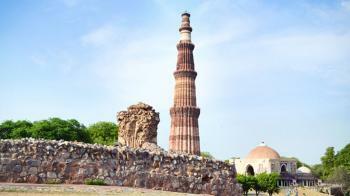 Qutab Minar is among the tallest and famous towers in the world. The tower is located in the Mehrauli area of Delhi, India. It is the most visited destination in India only next to Taj Mahal. But in 2006 it was the most visited place, even beating Taj Mahal. So it is easy to imagine the rush and the crowd any given day. The minaret is 234 feet high and the highest individual tower in the world. 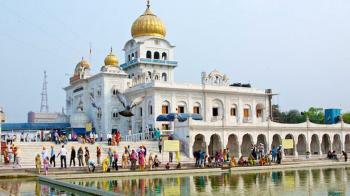 Gurudwara Bangla Sahib, it is located near the main Connaught Place in Delhi, India. Originally this place was the Bungalow(haveli) of Mirza Raja Jai Singh, hence the name Bangla Sahib. It is a sacred shrine dedicated to the Eight Sikh guru, Guru Hari Krishan ji. Guru Har Krishan, a prominent Sikh guru also lived here and served many people during his lifetime. People from various religions, castes and places visit this holy place . 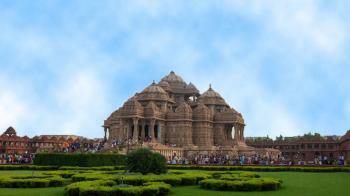 It is one of the best places to visit when you are in Delhi. Sikh pilgrims flock here at all hours, and devotional songs waft over the compound, adding to the contemplative mood. 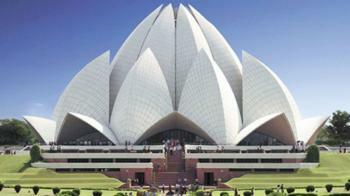 Lotus temple is one of the main attractions of New Delhi. This temple is built in the shape of a lotus flower and is the last of seven Major Bahai's temples built around the world. The Bahai’s faith is considered by some as the newest World Religion. Their main thrust is unity of all religions and mankind. It signifies the purity and the universality of the lord and equality of all religions. The Temple is visited by over four million people annually. This temple completed in 1986 it is set among the lush green landscaped gardens.